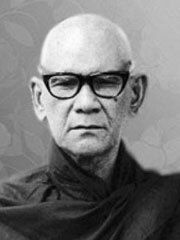 Mahāsi Sayādaw (1904-1982) was a famous Burmese Buddhist monk and meditation master who had a significant impact on the teaching of Vipassana (Insight) meditation in the West and throughout Asia. In his style of practice, the meditator anchors the attention with the sensations of the rising and falling of the abdomen during breathing, observing carefully any other sensations or thoughts that call the attention. The Mahāsi Sayādaw was born in 1904 in Seikkhun village in Upper Burma. He became a novice at age twelve, and ordained at age twenty with the name U Sobhana. Over the course decades of study, he passed the rigorous series of government examinations in the Theravāda Buddhist texts, gaining the newly-introduced Dhammācariya (dhamma teacher) degree in 1941. In 1931, U Sobhana took leave from teaching scriptural studies in Moulmein, South Burma, and went to nearby Thaton to practice intensive Vipassana meditation under the Mingun Jetawun Sayādaw. This teacher had done his practice in the remote Sagaing Hills of Upper Burma, under the guidance of the Aletawya Sayādaw, a student of the renowned forest meditation master Thelon Sayādaw. U Sobhāna first taught Vipassana meditation in his home village in 1938, at a monastery named for its massive drum ‘Mahāsi’. He became well-known in the region as the Mahāsi Sayādaw. In 1947, the then-Prime Minister of Burma, U Nu, invited the Mahāsi Sayādaw to be resident teacher at a newly established medition center in Yangon, which came to be called the Mahāsi Sāsana Yeiktha. The Mahāsi Sayādaw was a questioner and final editor at the Sixth Buddhist Council on May 17, 1954. He helped establish meditation centers all over Burma as well as in Sri Lanka, Indonesia, Thailand, and by 1972 the centers under his guidance had trained more than 700,000 meditators. In 1979, the Mahāsi Sayadaw travelled to the West, holding retreats in Vipassana meditation, at newly founded centers such as the Insight Meditation Society (IMS) in Barre, Massachusetts, U.S. In addition, meditators came from all over the world to practice at his center in Yangon. When the Mahāsi Sayādaw passed away on the 14th on August, 1982 following a massive stroke, thousands of devotees braved the torrential monsoon rains to pay their last respects.